Finding the right product for your needs isn’t just a time-consuming process, it can be stressful. Here at MyGolfSpy, we feel the best reviews are those that help you make the right choices and help you get the most out of your time and money. The MyGolfSpy mission is simple: conduct and publish the most objective and comprehensive product tests in the golf industry. One key to our testing protocols is that we test every category head-to-head. We select the top products and put them through rigorous side-by-side testing. We test in the lab and in the field. We score each product across a range of weighted categories. We then rank the products, explain why, and give awards to the best performing products. For 2018 we approached Cart Bag testing with more critical scoring and improved protocols from previous years. Changes were based on an intensive look at the market and feedback from consumers just like you. Several key findings from that research influenced the updated bag testing process. Everything from the organization of dividers, efficiency of zippers, rigidity of bag, the design of pockets, and the installation of divider linings were – among many other things – considered. We put in hours of testing utilizing data-driven protocols to test new metrics. The numbers are more meaningful than ever. Over the course of the test, bags were loaded with 14 clubs, and a dozen golf balls. Our panel of testers was encouraged to load and unload clubs from the bag as they would during a typical round of golf. While some golfers do use cart bags on push carts, our tests focused on usability while attached to a driving cart. Storage (42.5 points) – In this category, we consider the functionality and capacity of the pockets. The number of pockets is not important here, only how much stuff the bag fits. Top performing bags feature storage that is designed and built in a way that allows for the full utilization of the space. On the other hand, in some of the poorer performing bags, while the potential for greater functionality exists, stitching inhibited the use of the storage. The highest performing bags within this category, feature pockets that are accessible and easy to use when the bag is mounted on a cart. Style (10 points) – Score is established by considering what we believe the majority of consumers would deem stylish, not whether the individual tester likes the look of the bag. Survey questions provided to testers were developed to combat any brand-driven favoritism on the part of the individual respondent. Weight (5 points) – All bags are ranked based on weight, and then assigned relative scores. For example, the lightest bag in the test received 5 points, second lightest received 4.75 points, and so on. The heaviest bag received 2.75 points. Strap Pass-Through (5 points) – Based on the strap’s on-course functionality. A design flaw found in some bags, pockets become inaccessible when the pass-through is used on cart. Pockets (15 points) – Score is based on whether a bag has or does not have certain pockets outlined in our predetermined checklist (including rangefinder pocket, insulated pockets, storage pockets, ball pockets, etc.). Interesting pockets outside of our list are always noted and investigated thoroughly. Pockets are tested head to head which results in some pockets – PING’s one finger magnetic rangefinder pouch for example – becoming the benchmarks by which similar pockets are scored. Dividers (15 points) – Combines the design, build, and overall functionality of the dividers to establish a score. While the tendency for the clubs to grab was considered, it was not the sole consideration. We also noted the arrangement of the dividers and whether or not the design inherently aided in club organization. Zippers (7.5 points) – Score is based on how effective the zippers function and how easy they are to use. The best performing bags need one hand to open, and the zippers do not snag or catch, while the lower performing bags need two hands to open and snag and catch when opening. While zipper function is necessary for an effect bag, we score on how easy it is for the player to access the pockets with the need to use one or two hands when using the zippers. Final grades were awarded based on total scores. Best Overall is our highest overall scoring bag, and awards are awarded to the top five cart bags. Also, more specific Best in Class recognitions are awarded to bags in certain categories (like storage, lightweight, etc.) that push the industry envelope. I don’t go anywhere without my Ogio silencer bag. My clubs love it! 14-15 individual full length dividers, no tangling please, very important, golf is hard enough. Top designed such that longer clubs go in the back/shorter clubs in front to work well with riding and push carts. A stand so bag doesn’t tip over when trying to set bag up on uneven grassy areas, slopes, etc. during practice time. Cooler pouch optional, I can buy beer from the cute beer cart girls. If you can’t through, that is OK, I can’t find this kind of bag anywhere, I’ll take some more socks. 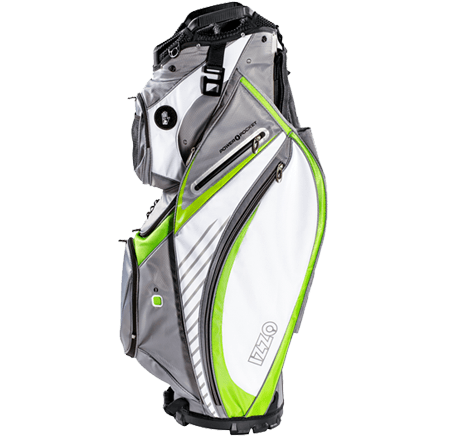 I used a Titleist stay dry carry bag which also worked well on my push cart. The only problem was clubs sometimes were hard to get in and out ,I play 5times a week and this bag has stood the riggers of in the car on carts and still is in good shape. Read the studies on cart bags and ordered a Mizuno cart bag ,boy what a mistake. They make great clubs but bags not so much. Putter gets stuck in the slot, separations do not go all the way to the bottom of the bag, the bag is not water proof , umbrella goes through one of the side pockets and catches on clothing inside the bag, only has one ring for towels, pockets leak, the handle is on the wrong side, bag cover took me three tries and four buddies to put on by then it was not needed as everything was wet by the time we figured it out. What a waste of $280.00 on this bag will stick with the stay dry. And oh ya the pocket for drinks has a drain hole but doesn’t drain. I agree the Bennington bag with clubs in separate club holes around the perimeter, three divider slots in the center, and separate putter well on side, some have putter well on each side. I have three Bennington bags. Only negative is they get heavy when loaded with clubs, balls, and other equipment. Great for leaving bag on cart kept in garage to play on local course. I have and love the Sun Mountain C-130. How can it not be in your review? I play over 100 rounds per year and it still looks great. I believe it is the most popular bag out there when you combine features and price. I even got my name added for free on a Christmas holiday promotion. I just took a 2018 C-130 back. A few of the pockets by the putter well are more triangle shaped and it is difficult to pull clubs with midsize grips. The 4 holes in the center somehow get tangled and pulling/replacing clubs from those holes was a chore. Outside of that it was a great cart bag. I occasionally use a push cart, and it was terrible as a push cart bag. None of the clubs wanted to come out. Granted that isnt its design, but I never had that issue with the older model C-130 it replaced. Going with the Ping Pioneer or Callaway Org 15 (despite the $280 price). They will be the first non Sun Mountain bags I have owned in 15 years. 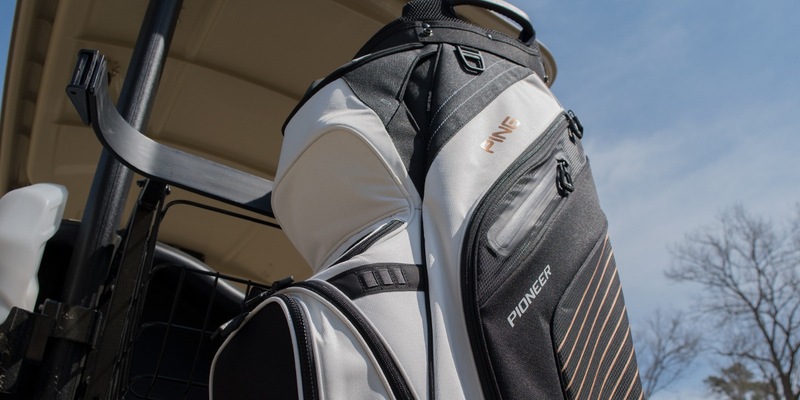 I purchased the Ping Pioneer in 2016, and have enjoyed all of the conveniences it has,…velcro, magnets, size & location of pockets, club dividers, etc…Overall, it was a great purchase, and I would do it again if purchasing another bag. However, I have one issue with the bag. One of the larger pocket interiors began to pull away from the stitching area. It is not that the stitching began to unravel. Rather, where it was supposed to be stitched in one area, it was not. It has not affected the overall use, and I have had anything go through the larger hole that was created as yet. Just a note that anyone buying the bag, may want to check the interior to make sure that everything is stitched properly. I bought a Ping Pioneer (Red/Graphite) after reading last years #1 ranking. After using SunMountain Bags for Many years (had 3 C-130 models) this Ping Pioneer is great. Zippers are easy to use and never snag, quality of the bag is awesome. Clip on the inside pocket is a great feature to hold my car keys and easy to find, don’t have to dig through one of the side pockets and doesn’t take up space in them either. More deep pockets than you need and the clubs slide in and out with ease. Ping bags are top quality that’s for sure. any Test without c-130 or sync from sun mountain just doesn’t count in my book. I get it. You can’t test them all. The c-130 has been best selling cart bag in my shop for 7 straight years and it’s not even close. Sold 48 last year. . And we carry pretty much all of them. I PLAY AT A HIGH END PUBLIC CLUB -5 DAYS A WEEK- AND HAVE NEVER A NEED TO HANDLE MY BAG, UNLESS I AM GOING TO SOME OTHER PLACE ON AN INVITE, SO WEIGHT IS NO FACTOR. EASE OF CLUB REMOVAL AND STORAGE FOR ALL KINDS OF STUFF IS PRIMARY, SO I STILL P-LAY A BIG OLD TOUR BAG. THEY ARE EXPENSIVE BUT LAST FOREVER. MINE SAYS TOPFLITE ON THE SIDES AND STILL HAS MANY YEARS OF SERVICE LEFT IN IT. SO IF $500 IS THE PRICE -AMORTISED OVER 20 YEARS IT ISN’T EXPENSIVE. BUT IT SURE IS CONVENIENT…….AND IT IMPRESSES THE “NEWBIES” AS MUCH AS ME SHOOTING MY AGE ALMOST EVERY ROUND- I AM 82. It seems the ball pockets are on the opposite side from the carry handle so it’s not easy to place the bag on the cart with the ball pockets facing you. Most of the older cart bags had the handle on the same side as the ball pockets so it was easy to place the bag correctly on the cart. I think one of the most overlooked things in a golf bag are hanger loops. You need two not one. Towels, grove cleaning brushes, rangefinders, assorted things we hang on our bags. I think they need one on each side you don’t want them hanging in the middle between two big bags. I’ve had two Ping Pioneer bags and love them. The features are exceptional, well made and durable. One thing that isn’t mentioned is the key ring holder inside the side pocket. Never have to look for my keys after my round, they’re clipped in there always easy to find. 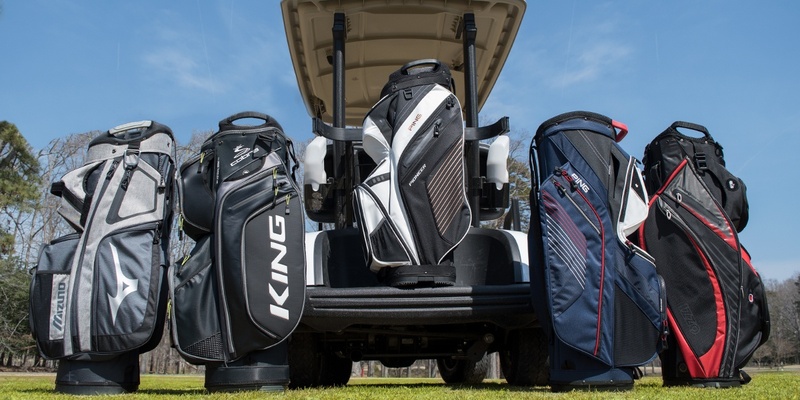 For me, the weight of the bag, ease of use in and out of a car, how it sits on a cart (bulge, space), umbrella holder, ball retriever storage and carrying handle arrangements are critical components. Some cold storage but couldn’t care less about 6 or 12 cans of beer or whatever. I go to play golf, not drink. That’s for the post-round wind down. Without seeing how you determined features ranking and the features considered, the results for that column are meaningless. What ranking you gave to each individual feature compared to every other feature would also prove instructive. Style is personal, so I totally discount your rating of that aspect. Cell Phone storage (I know, but let’s be real. Everyone on a course today has a cell phone either on ring or vibrate). How the bag sits on a golf cart. Does it leave enough room for the other player’s bag, or does it bulge with all of the pockets holding different items. For me, that is a critical feature. I play with too many people who stuff their bags so full there is almost no room for my bag on the cart. I recognize features, like style, are totally individual, but that’s my checklist. I agree with a lot of points NEF made – the article wasn’t very helpful for me because I need to know more about whether or not clubs slide in and out easily, the profile of the bag (meaning basically the diameter), and how accessible (and deep) the pockets are. I think what we’re both saying is that we’d like to see you go more in depth in the evaluation, like you usually do with other equipment. Maybe that wasn’t done because of the number if bags being evaluated. 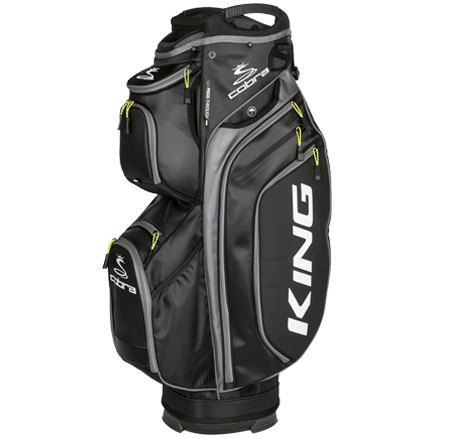 The bag I would like to see is a cart/stand bag hybrid bag with bigger pockets without zippers. Velcro or magnets to close the pockets. 7 dividers with a putter well. Finishing a full round of golf in 3 hours means: you play by yourself, play short courses and are not very serious about your game! You do know this a review of CART bags, you know the kind that are strapped to your golf cart. P.S. I am a professional at removing 2″x4″ ‘s from asses. I want to be able to fit at least 4 cans plus ice. I do walk, can easily play in under 3 hours if the slow @$$es in front would speed up. And BTW my tipsy @$$ would beat you any day of the week! Noticed you didn’t test the Callaway bags… I just wore out the best cart bag ever. Capacity for a 12 pack in the cooler pocket. Would love to see a stat for # of cans the insulated beverage compartment will hold. 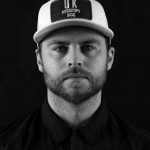 Thanks for another great article. I just bought a Ping Traverse based on last year’s test and couldn’t be happier with it. It was a big upgrade from what I had been using. Always a nice review guys!! Good job. IMO, Carry/Stand Bags are for carrying and Cart Bags are for Riding and Push Carts. I don’t think “some golfers” use cart bags on push carts, I think most golfers use cart bags on push carts. In future testing of cart bags the tests need to include ability to secure, stability, and ease of club access on the most common types of push carts. I agree, most push cart users use cart bags. And not many cart bags are good on push carts. The top design is the biggest issue. I think weight is important with cart bags. Sure, someone is not carrying them, however, with a push cart it adds quite a bit. Also if someone is lifting them in and out of a vehicle it makes a difference. I love how you guys break down every aspect not just how many pockets but the usefulness of them and ease of them. I would love to see which ones work best with push carts, whether carry or cart. I use a cart bag by “Nevr Looz” – see it on the web. Best I ever owned – all clubs visible, in order, good storage. When the cloth parts are worn, simply order a new cloth cover for roughly $100 – with your name on it – sure beats the $220 ++ for an entire new bag. Perhaps next year you could include Nevr Looz. I’m glad to see that someone actually bought a NEVR LOOZ cart bag. It was tested I think in 2017, pretty sure it was ’17. Think it finished towards the bottom, but I love the weird/different look of it. Have been strongly considering purchasing a NEVR LOOZ, but still on the fence. Would you get another one if needed? I’m just sick of the so called full length dividers, my Sun Mountain still tangles the grips. I have Grip Master kangaroo leather grips on all clubs, and the tackiness of the grips really make it difficult to pull one club. Any other info/thoughts/comments would be greatly appreciated. Thank you in advance. Thanks for the review! Please do a Sunday bag review! I love playing with just a few clubs and really enjoying the walk. Bobby jones makes a great bag for the Sunday golfer. So does Titleist and Ping .they have one long pocket and one small pocket. And very very light . Great job MyGolfSpy for putting in the time and effort to test all the products! For those saying “why don’t I see ______ bag?” If you don’t see one, complain to that company – you can’t test/rate something you don’t get. And for those saying “_________ bag is better because (some small feature that’s important to them)” – these tests are designed to determine the best products for MOST golfers, not you specifically. Use the information and rankings as a starting point, then make your own decision. MGS – one suggestion (based on personal experiences). Next time test the ease of putting the bags in/out of a car trunk and the strength of the strap. I have an older Ping Traverse and if it’s fully loaded (like for a vacation or desert trip) it’s kinda tough to maneuver in or out of my car. Also, the original strap couldn’t handle the weight and failed twice on the short walks from home to car or car to cart. I replaced it with an old TM strap and no more problems – things like this would be handy to know in advance. The key features for me being the overall weight, 6 LBS, and more importantly,the four way full length dividers. This design allows space for extra clubs during practice rounds and practice tools, like my orange whip. It also provides easy access when retrieving and replacing clubs to and from the bag during the round without looking for that one empty small tube like opening. All this is accomplished while maintaining the classic look of an unpretentious staff bag with minimal signage. I love this bag. 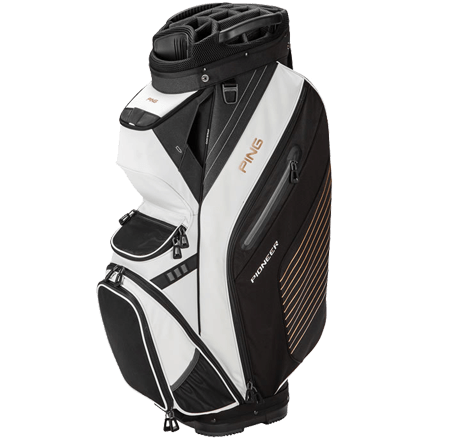 Ping Pioneer was a finalist for me, in the end I ended up going with the Taylormade Supreme cart bag for two reasons: The zippers are heavy duty, so they should last forever and the outer pockets did a better job holding my rain gear. I really liked the Pioneer’s full length club dividers and the pockets down the front. Both were heavy, but I strap it onto my push cart so no big deal there. Mike, do you mean that each club has a full-length divider? Yep! I bought my bag in October, so I can’t say with 100% certainty, but I believe the Ping bag had 15 full length dividers, where as the Supreme bag has 15 dividers, but they only go full length by row. My first priority is full-length, individual club dividers. Most bags advertise that they have that but don’t. I’ve even called different bags suppliers and asked if their bag had the full-length, individual club dividers and was assured that their cart bag did have that feature only to find that after receiving the bag that wasn’t true. I’m a push cart user and I’d love if these tests evaluated which cart bag is best when that orientation. Right now I have the ClicGear 3.5+ along with the ClicGear B3 bag and while I love the look and storage of the bag, I hate the club chatter. No arrangement of the clubs makes it any better in my experience. These bags basically sit at a 45* angle towards the back on these carts. 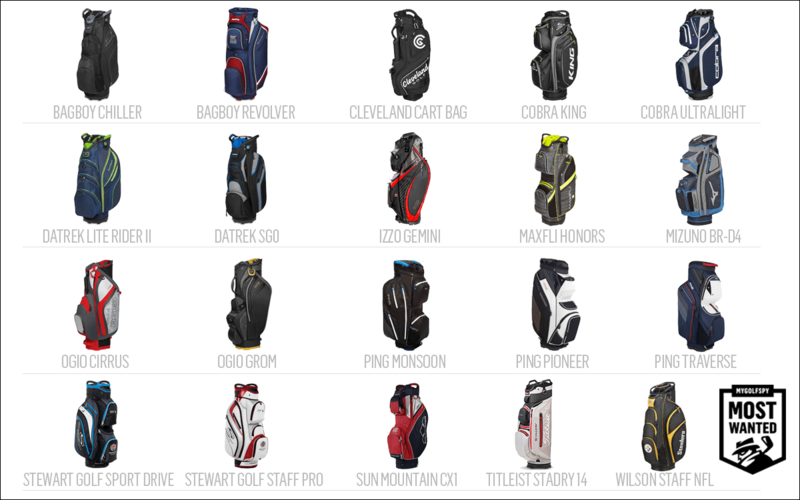 Would be nice to have an evaluation of which bag presents the clubs best when in this orientation. Another thing to consider with the rise in One Length clubs is how they will sit in these bags. I’m about to make the switch and I’m fearing the club chatter will be worse. 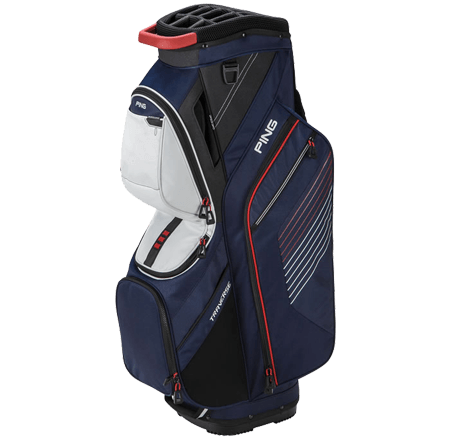 If any bag has a nice arrangement that keeps the clubs relatively separate while laid back in the push cart orientation it would be great to know! Finally I wonder when a bag manufacturer will market a push cart bag as a thing of its own optimized for that orientation? I too would love a push cart bag combo evaluation. The challenge would probably be the enormous amount of combinations. However, I would think if they chose a standard cart that would at least give an idea as to the functionality of the bag on a cart in general. Bought my ping pioneer after it won last years award too. I have been pushing my cart for years and it works like it was made for it. My favorite feature is the “refrigerator “ to keep our adult beverages cold down here in Albuquerque. Word of advice in colors black stays and colors fade! Bag Boy Defender. Period. 14 true full length dividers. 12 pockets, 10 with zippers. And the zippers are quality. Dedicated range finder pocket. Generous cooler with drainage holes (why they all don’t have them is baffling). 2 hard shell lined valuable pockets (huge for those that wear eyeglasses. Umbrella sleeve, divot tool pocket are a nice touch. 7.6 lbs. The kicker is the the Top-Lok tech. On walking days slips right into my Bag Boy Quad when without using a strap. Truth be told I almost went with the Ping Pioneer last year. But the additional pockets and the Top-Lok feature made it a no brainer for me. It’s a set up that could well last the rest of my playing days. I suggest trying out the Top-Lok before investing. Forgot to mention…..It doesn’t have an outside putter tube. Thought that might bother me. Turned out to be a non issue. It’s more than generous enough. Also forgot to mention the cart strap sleeve. A feature none of the other top contenders have. It lines up perfectly to secure in the cart. Where is the Sun Mountain C-130. The most popular bag on the planet? Personalty, I prefer a bag with an outside tube. Currently I’m using a RJ Sports bag with a tube on both sides. Best utility bag at a reasonable price. I have the PING DLX based on last year’s reviews and it doesn’t disappoint. Has all the features I wanted and has been a wonderful bit of kit-cooler (awesome), key clip, magnetic pouch for the RF etc. The reviews didn’t disappoint. Kind of surprised it wasn’t in the mix this year, but it is basically the same as the Pioneer only with a vinyl shell which I like better. I’d love a putter well – one that’s large enough for oversized grips that are so popular these days. And I’d like to know the interior height of the bags. I’m on the short side so my shorter clubs tend to hang by the toe, especially my expensive putter with its 30″ shaft. One factor the is imperative for me is eliminate bag chatter causing nicks in the clubs. First in my opinion is the Ogio Silencer. It keeps clubs locked in and completely stops bag chatter. It is available both in cart and carry style bags. I was disappointed that this Ogio model was left off of the contender list. Anyone that cherishes their clubs should put this bag at the top of their list. Face Saver head covers. They lock on the shaft. Not a one has fell off. My forged irons don’t have a single chatter dent in them. I like a bag that has a designated place to hang your car keys. So you don’t feel like you lost them after every round. There is a clip inside one of the large side pockets to clip your keys so they don’t get lost in the bottom of any of the other pockets. Where do you play golf? And what is the make of your car? I bought the PING Pioneer last year after it won your 2017 Best Cart Bag review and I just want to say THANKS! That cart bag is awesome. Everything you pointed out in your review was spot on. The best feature of the Pioneer is the HUGE built-in cooler. It easily holds a 6 pack with ice. I understand that you focused on riding cart bag performance, but many of us use push carts (or in my case a motorized trolley). If these had top straps like a riding cart, many of the top bags would work. However, most use a bungie-type strap that joins in the middle making most of the bags unusable. I notice that you didn’t include the Sun Mountain C-130, which this year has a lift-up top pocket section that would work for a push cart. I would have liked to see how it stacks up to the others (it is expensive!). It also comes in a 5 or 15 divider version. I’m torn as to which I’d rather have. We leave the submission of the products down to the OEM because they have the final say on what they want submitted. We do understand that the straps might interfere with the zips on a push cart, but the vast majority of cart bags on the market are designed for cart use functionality only. Just a follow-up. Earlier this year, I bought a Ping Pioneer for my wife, and she likes it very much – replaced a favorite old Ogio bag. Why do golf bags no longer have the external putter well??? Not a single bag out there anymore, I use a 33 Inch putter and the bags with no putter well on the side screw up my Putter Headcovers. The cleveland has a putter well on the outside of the bag if that helps you. Totally agree, and my wife still uses and really likes an older SM cart bag with the external putter well. But that said, I bought the Pioneer after last year’s test, and would note that excluding the ‘internal’ putter well, the bag has fourteen slots, ie 15 in total, and that internal putter well has a much larger diameter than our older SM cart bag, which accommodates the currently popular Super Stroke putter grips so much better. to wit, my putter so equipped won’t fit in the external putter well of our older bag. 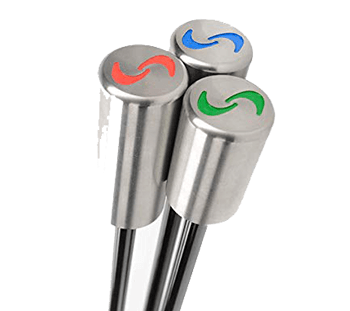 Perhaps the current trend away from them is a way to accommodate the SS gripped putters without having to add an unsightly 3″ diameter tube to the outside of the bag. That’s a carry bag. Which is great if you aren’t concerned about being prepared for everything. My “I GOTCHA” ball retriever has already paid for itself. Not to mention sun screen, rain gear and so on. Is it heavy when full? Sure. But it’s only going from my trunk to a cart or my push cart. Different strokes as they say. My golf bag buying decision is purely on looks. I don’t like the look of the Ping bags with the ugly stripes on the side. 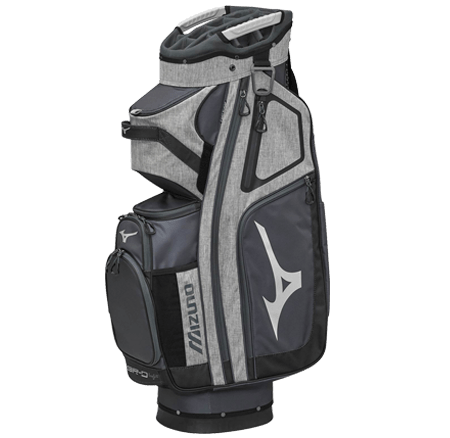 I do like the looks of the Mizuno bag but I currently use a Titleist Deluxe Cart Bag. Leave a Reply to P.J.